Cyclists in the City: London gets a new US embassy in 2014: Financial Times says London needs to build proper bicycle routes so people can get there. Good. The bike infrastructure in this area is a complete joke. London gets a new US embassy in 2014: Financial Times says London needs to build proper bicycle routes so people can get there. Good. The bike infrastructure in this area is a complete joke. The Financial Times has a weekend edition that includes a sizeable 'House & Homes' section every week. The FT's House & Home reviews significant developments in the global housing markets. It tends to focus on houses in the context of global investors and most of the homes featured in the FT are slightly off the scale of the average Londoner - Donna Karan's 7,000 square foot Manhattan pad featured last week, for example. But as a measure of the international market for real estate, it's a lively and important read. Which is why I was surprised a few weeks ago to be contacted by the Financial Times House & Home team about cycling. The FT was writing a piece about the new Vauxhall-Nine Elms regeneration scheme, they told me. The FT felt that lack of cycling infrastructure around Vauxhall was a concern and might hold back potential investors/future residents. What did I think? For those of you who've never heard of the snappily-named Vauxhall Nine Elms Battersea development, this is where London's US Embassy will be moving in two years' time. It will also be host to 16,000+ new homes and lots of new offices. One of the big challenges with the whole development is that is is a complete pain to get to. "Key to the success" of the scheme, says the FT, is the extension of the Northern Line - planned to Battersea Power Station. So far, so normal. boxes, wiggly lines, broken paving. You name it. But then the FT does something I've never seen before: It starts talking about the need to "create a safer and far more extensive cycling terrain" at Vauxhall Battersea Nine Elms and devotes a whole section to the woeful lack of cycle infrastructure here. 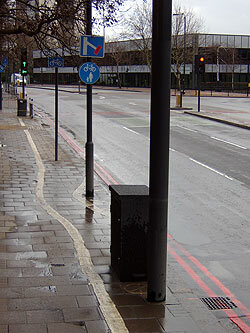 Rob Ainsley, of Real Cycling blog, devotes a whole page to the existing cycle infrastructure around here, including Nine Elms Lane, which runs through most of the site and which , which he describes as 'a candidate for the worst cycle path in England'. According to the FT, things may improve: “A new network of cycle paths and walking routes will be created that will be almost entirely shielded from traffic,” says Ravi Govindia, [Wandsworth] council leader and co-chair of the Nine Elms Vauxhall Partnership. “This will include a brand new stretch of the Thames riverside path and a linear park running continuously from Battersea Power Station to Vauxhall Cross.” There's also talk of a bike and pedestrian-only bridge to Pimlico. I'll believe that when I see it. The last bike and pedestrian bridge proposed across the Thames was nixed by Boris Johnson in favour of a pointless cable car. Back in Battersea, it's by no means clear whether these proposed bike routes will be any good. Will they be as inviting as the current riverside park, for example, which is so heavily used by pedestrians, that it's near impossible to cycle along, or will there be clear, functional cycle routes through the area? It all seems worryingly vague at the moment. That said, what really strikes me about this piece in the Financial Times is the simple fact that here we have one of the world's leading financial newspapers talking about an urban regeneration project in London and deciding to major on the lack of cycling and walking infrastructure as a significant issue. Something similar is going on in New York as well. The famously anti-cycling New York Post (think Daily Mail and times that by 10) finally admitted last week that New York City's increasingly extensive network of protected bikeways might after all be working: "A whopping 177 percent more cyclists rode First and Second avenues after dedicated bike lanes were installed there in 2010", says The Post. But more importantly, the newspaper notes that more cycling is good for business: "Shops along the route of the protected bike lane on Ninth Avenue — from 23rd to 31st streets — got a 49 percent boost in retail sales", it notes. Bike lane, New York City style. Bring it on London. 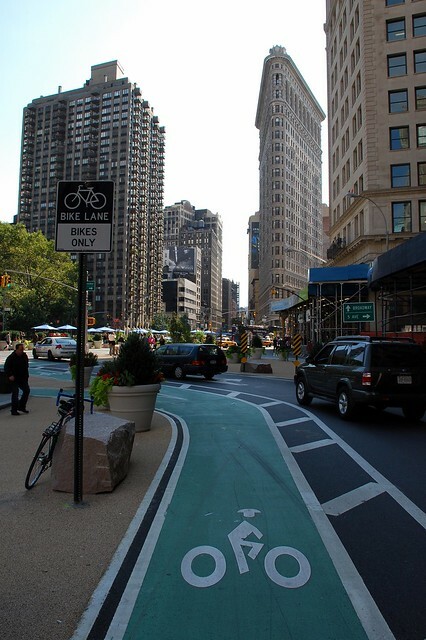 New York is being way braver with its bike infrastructure than London. In London, we're planning for the future by talking about bike lanes through parks, shared with pedestrians. New York is being very no-nonsense. Out goes one lane of motor traffic. In goes a 'protected bike lane'. What's going on at Battersea sounds good. The fact that a newspaper like the FT thinks bicycle transport will be important here is fantastic. 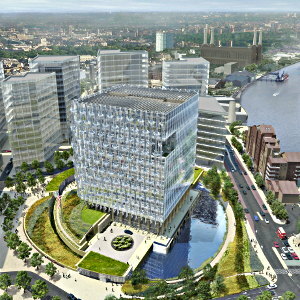 Battersea is soon going to be home to London's new US embassy. Question is, will the Americans be able to teach us a thing or two about building decent bicycle infrastructure around their new headquarters in Battersea? I hope so.